Aber es wird bestimmt spannend und aufregend. Ein neues Jahr … das ist für mich wieder ganz auf Anfang. So wie ein Neubeginn. Nur vergleichbar mit brandneuen Schulbüchern aus der Kinderzeit. Ich wünsche mir für das neue Jahr, das wir gemeinsam durch manch offene Türe gehen. Gemeinsam einen Teil vom Abenteuer Leben erleben. another door is opening.What is laying ahead? But I am sure it will be a little adventure, exciting and full of life. A brand new year … like starting from the scratch. This feeling reminds me of my school days, the day when I got the brand new books. Nobody could knew what I would learn from them. 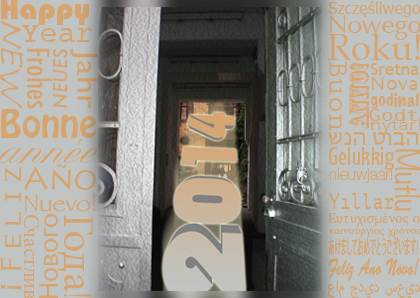 For 2014 I hope and wish that we will open one or another door together. That we will live the adventure of life together, at least some parts of it. I really believe we are going to have a white Christmas here in Berlin.